Digital photoframe / mediaframe with 10.2" LCD display. 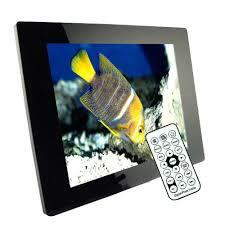 This model DMF (digital media frame) allows you to view pictures as well as playing music and video files. We heard your requests and now have it in stock for you, a DMF for the office, home, or dorm use. Why get a simple digital photo frame when for only a few bucks more you can have a whole lot more - a large screen digital media frame that works as a photo viewer, video player and digital music player. Yes, this model does all those, and also includes both an headphone jack and speakers! Simply plug in your favorite memory card and you can instantly start playing your digital media. In addition, when the frame is plugged into your computer it acts like a card reader so you can easily transfer files in between your computer and the photo frame. This is really a great product that can be appreciated by almost anyone, young or old.